This post is sponsored by Nutella®. Any opinions are my own. 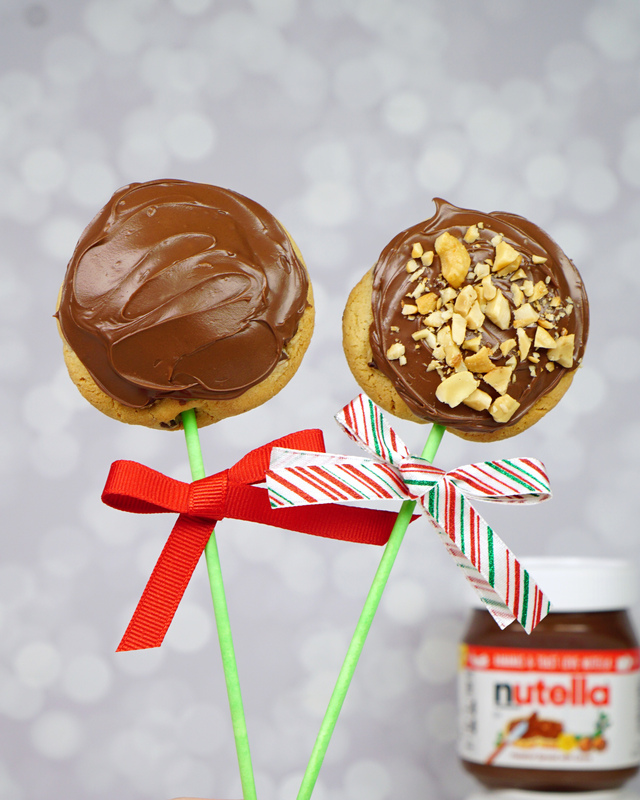 These delightful Chocolate Chip Cookie Pops with Nutella® hazelnut spread make a great holiday treat for friends, neighbors, family, and teachers! 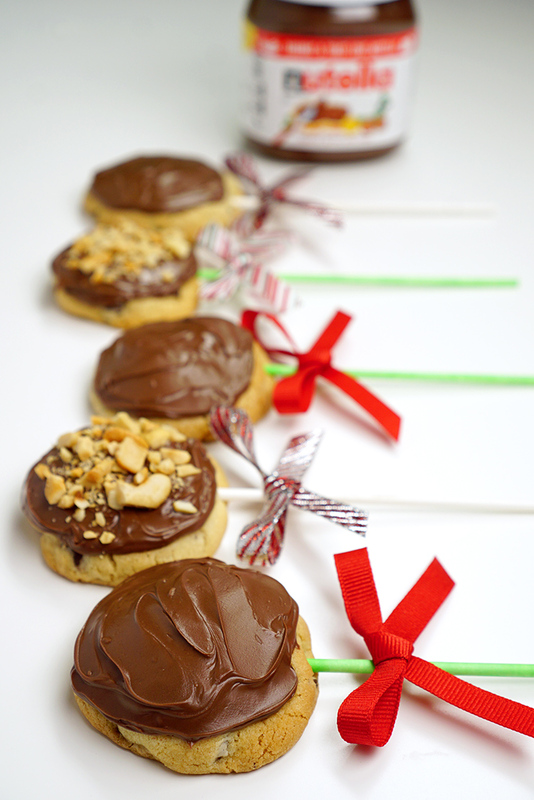 Perfect for Christmas parties, cookie exchange parties, classroom treats, office parties, and more! The holiday season is upon us, and it’s time for my favorite holiday tradition – holiday baking! Every year we do a lot of holiday baking for cookie exchange parties, neighbor gifts, and party desserts. 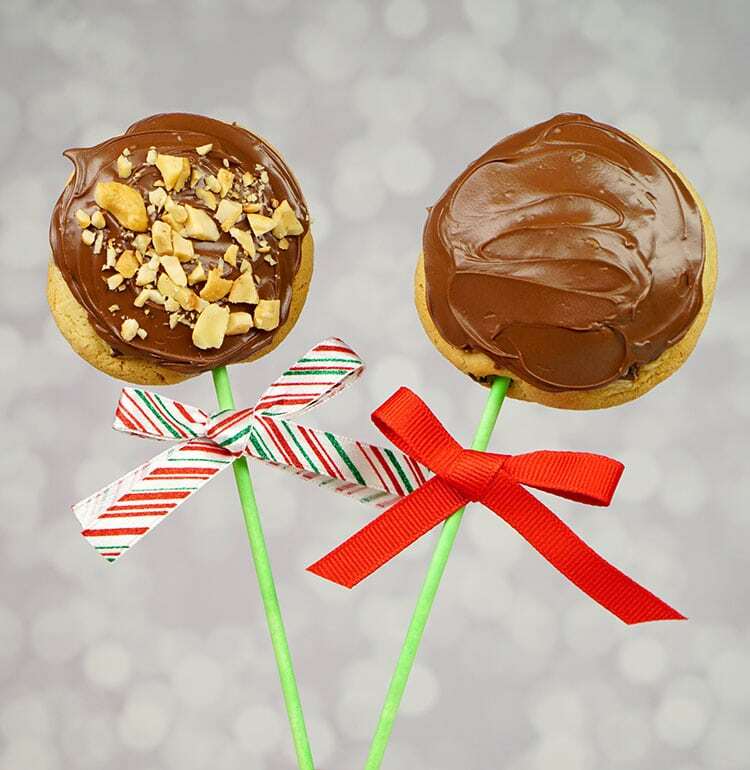 I love the holiday baking classics, but this year I wanted to add an extra layer of fun to my treats, so I whipped up these sweet chocolate chip cookie pops topped with delicious creamy Nutella® hazelnut spread! Want to wow your holiday gift recipients? THIS is the recipe! 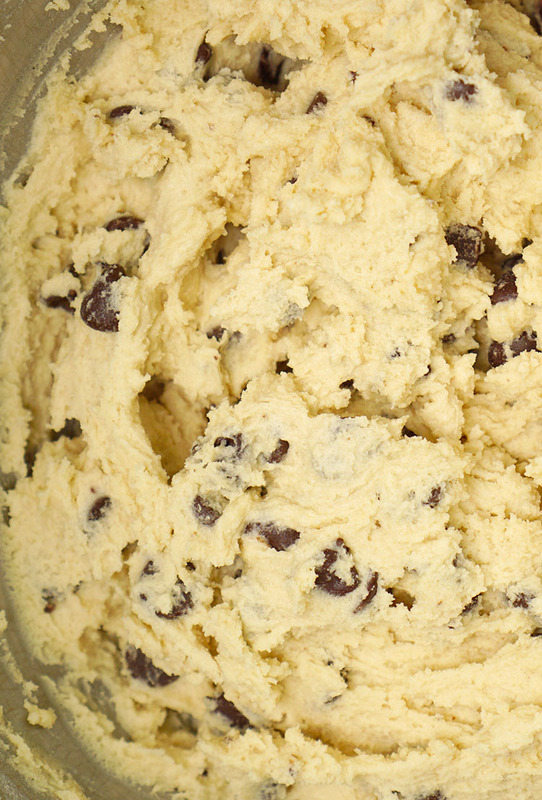 I started by mixing up a batch of my favorite tried-and-true chocolate chip cookie recipe. 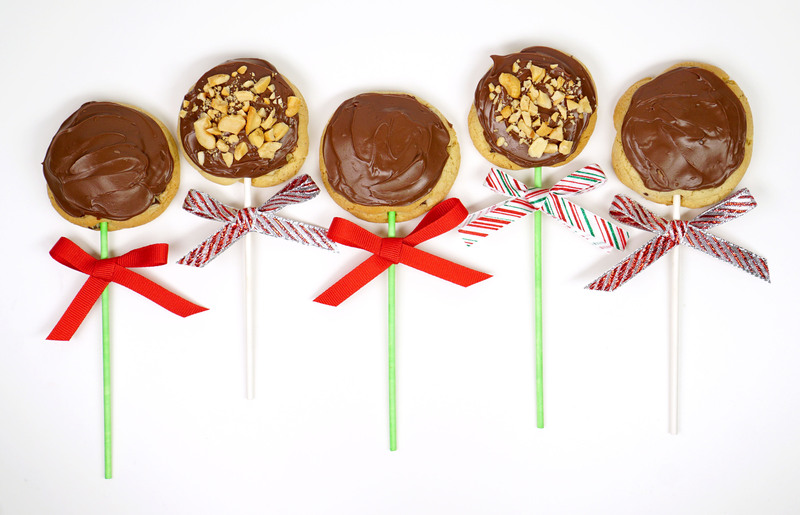 This recipe is always a huge hit, so I knew it would make the perfect base for my cookie pops! 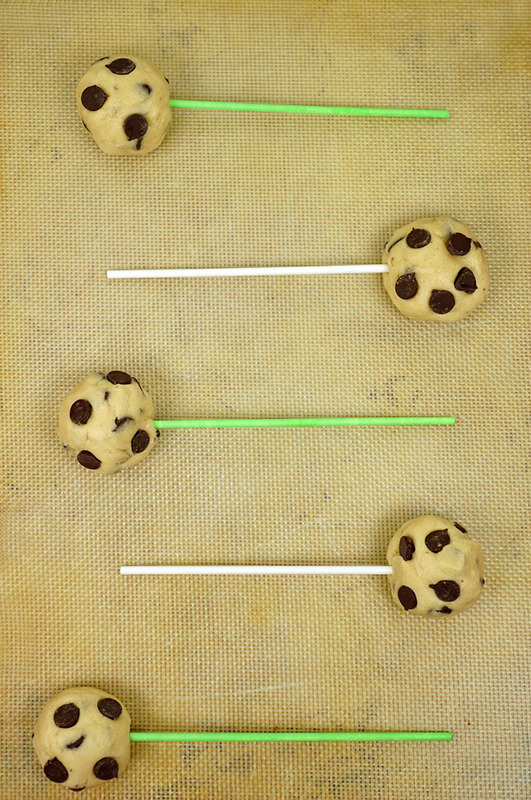 I rolled the cookie dough into large balls approximately 1.5″ wide and inserted the lollipop sticks. Next, the dough balls went into the refrigerator to cool for 15 minutes – this helps the cookies stay thick and not spread too thin while baking. Plus, the chilling step also gives the freshly baked cookies an amazingly perfect chewy texture that you just can’t beat! The cookies bake for 10-12 minutes until they are lightly golden and then cooled on the baking sheet for five minutes before being moved to a cooling rack. 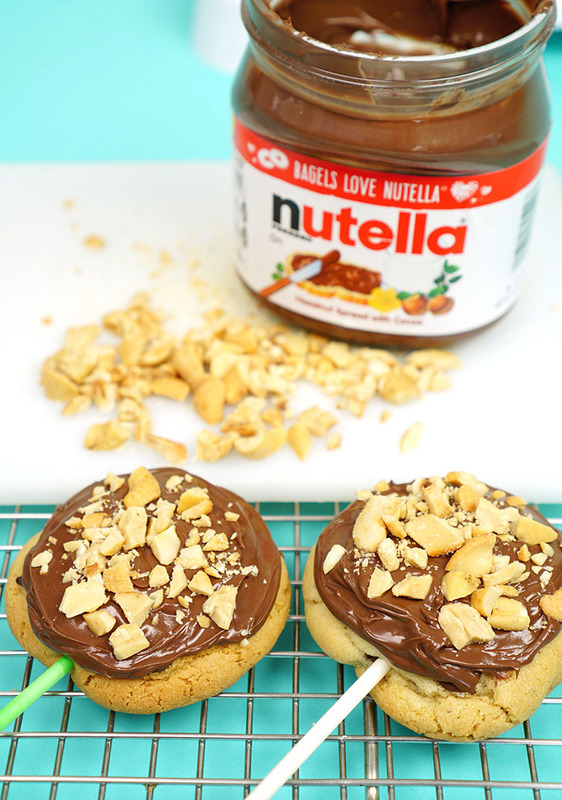 Once the cookie pops have completely cooled, it’s time to add the fun! 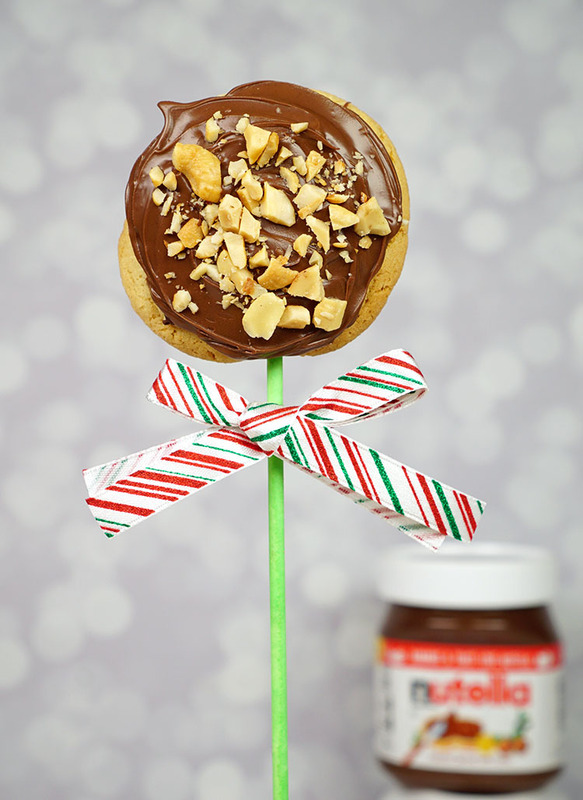 My family can’t get enough of Nutella®, the yummy hazelnut spread, that they add to everything from bananas to sandwiches, so I knew it would make the perfect addition to our holiday cookie pops! 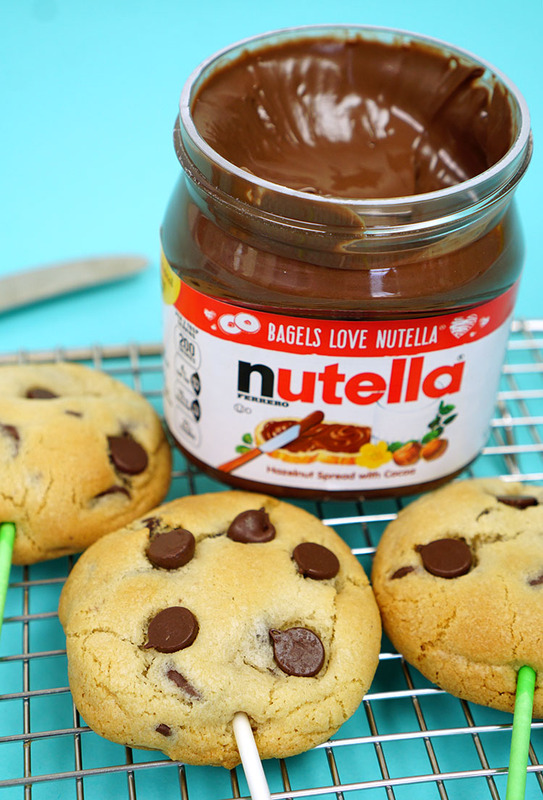 I used about a tablespoon of Nutella® on top of each cookie, and it was the perfect cookie-to-Nutella® ratio. 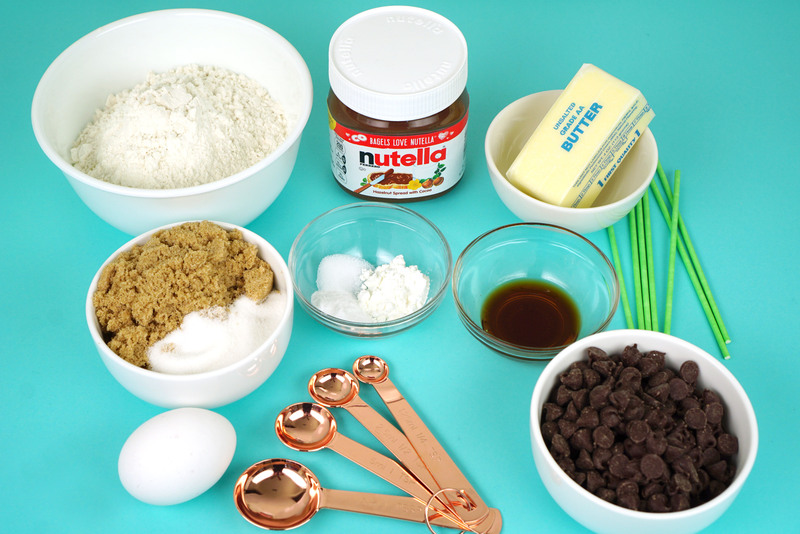 A little bit of Nutella® goes a long way towards making it the star of the show! 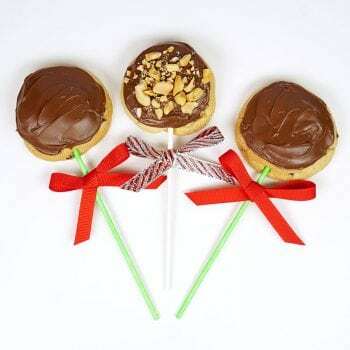 I topped a few of my cookie pops with chopped nuts, but crushed pretzels or dried fruit would also make fantastic toppings, too! 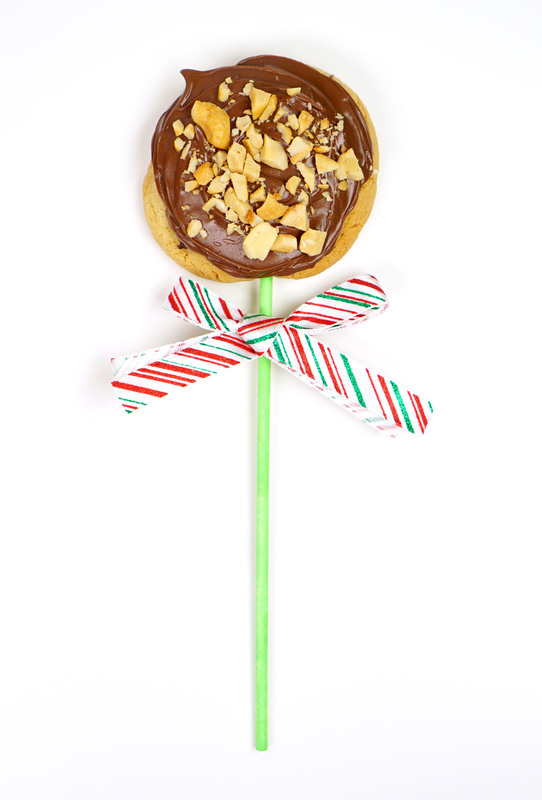 Add a cute ribbon and this yummy cookie pop is ready for gifting! If your cookies need to travel a bit to reach their final destination, wrap the cookie in a cellophane cookie bag before adding the gift ribbon. 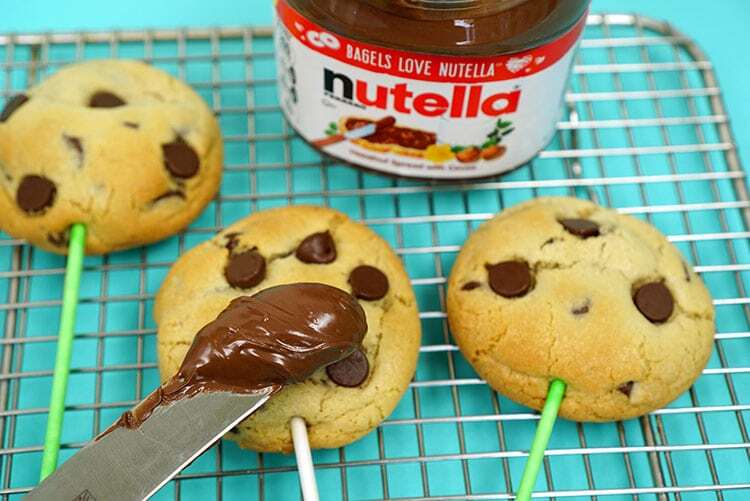 I mean, seriously, how adorable are these Nutella® chocolate chip cookie pops?! WAY cute! Bonus points for the fact that they also taste just as delicious as they look! Preheat oven to 350 degrees and line a baking sheet with parchment paper or a silicone baking mat. In a large bowl, cream together butter and sugars. Add egg and vanilla and mix well. In a small bowl, combine flour, cornstarch, salt, and baking soda. Add the dry ingredients to the wet ingredients and stir until completely combined. Add chocolate chips. Roll into 1.5" balls and insert 6" lollipop sticks. Refrigerate for 15 minutes. Bake for 10-12 minutes until the cookies are lightly golden. Allow to cool on baking sheet for five minutes before transferring to a wire cooling rack. Spread the cooled cookies with Nutella® hazelnut spread and top with chopped nuts, crushed pretzels, or dried fruit as desired. These yummy cookie pops look impressive enough to wow your party guests, but they were really quick and easy to make! Making your holiday treats gift-worthy doesn’t have to take a ton of time or effort! 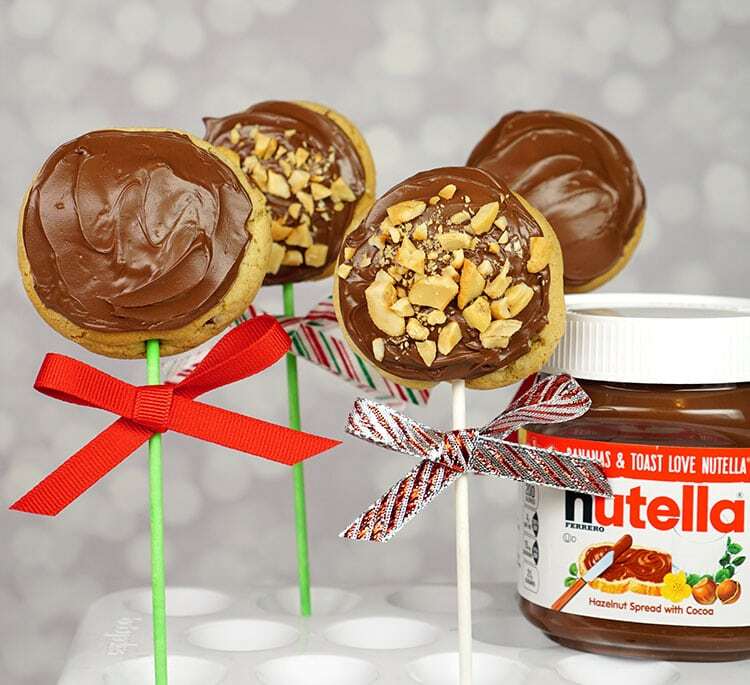 Using high-quality ingredients like delicious Nutella® hazelnut spread elevates these cookie pops from classic to fantastic! 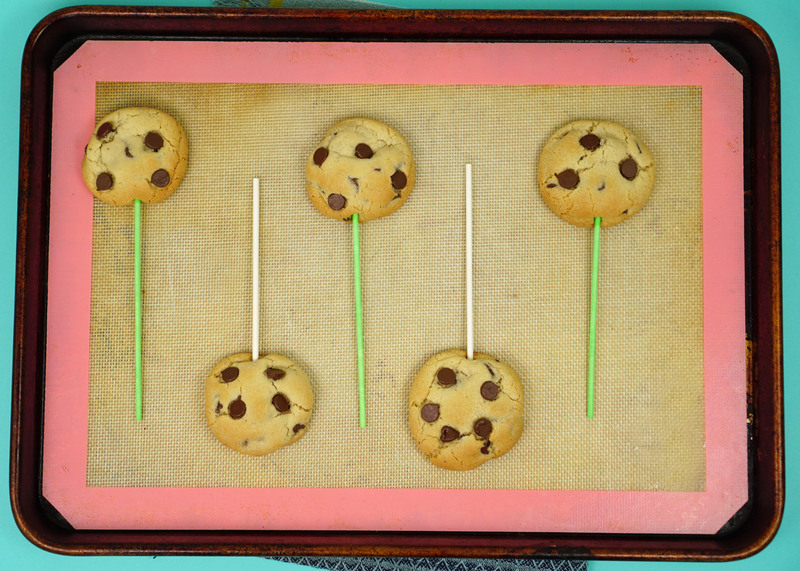 Pin these Chocolate Chip Cookie Pops for later!